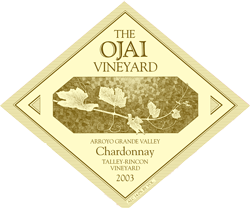 This is the third chardonnay that we are releasing from the 1999 vintage. Talley is a tad warmer than either Bien Nacido or Clos Pepe, and because of that the wine we produce from this vineyard is typically fatter and richer, with naturally lower acidity. In 1999 the weather was cool all summer, until the Talley chardonnay was almost ripe. Then, when we were on edge, wondering if we were going to pick too soon, a hot spell came and the sugars went from barely ripe to super ripe in a couple of days. This rapid ripening concentrated both the already high acidity and the intense flavors of a very small crop. This produced the most explosive Talley chardonnay to date. I would have never guessed it, but the richness of the fruit flavors balance perfectly the very high acidity of this wine. Everyone who tasted this wine in the barrel was impressed, and, in the bottle, I think you will be too.